Oyster season is in full swing and we’ve got the low down on where to grab these salt-water bivalves for just $1 all week. Not an oyster fan? Japanese ramen and skewer spot Robata JINYA is celebrating their 7th anniversary with an epic seven-course meal featuring all their greatest hits. This upcoming weekend an eclectic selection of things to do including a new vegan music festival called Circle V, Downtown Burbank’s Winter Wine Walk & Street Fair and a BBQ & Beer Festival in the Arts District. Oh, and if you need more after-work ideas, we’ve got a link to our latest listicle on the most eclectic happy hours happening this fall in L.A.
As always, enjoy the rundown of all the tasty news bites below, along with the best food events happening this week. It’s the perfect season to slurp down oysters. Here are our top picks featuring $1 oysters this week. Springside at Spring located in Downtown Los Angeles are offering $1 oysters paired with a mignonette and lemon during happy hour every Tuesday through Friday from 5-7 p.m.
CHAYA Downtown is shucking $1 oysters for the entire month of November during happy hour every Monday through Saturday from 4-7 p.m. in the bar and patio area. CHAYA Venice serves $1 oysters during happy hour in the bar area every Monday through Friday from 5-7 p.m. for the entire month of November. Church & State in the Arts District of Downtown serves a daily selection of $1 oysters during happy hour every Monday through Friday from 5:30-7 p.m.
Red O located in Santa Monica is offering $1 oysters for the entire month of November during happy hour every Monday through Sunday from 3-7 p.m. in the bar area. Have you read our latest happy hour round up? We highlight 10 Eclectic L.A. Happy Hours You Need to Try This Fall . Check it out if you’re tired of the same – old same – old. When it comes to the shrimp toast, double dipping is totally acceptable. Robata JINYA will celebrate its 7th anniversary by offering a seven-course prix fixe menu from November 15 to 19. The special menu features signature favorites from the past several years including Shrimp Toast, Wagyu Stone Grill and a Baked Crab Hand Roll. The special prix fixe cost $48 per person and is offered from 5 p.m. to close. 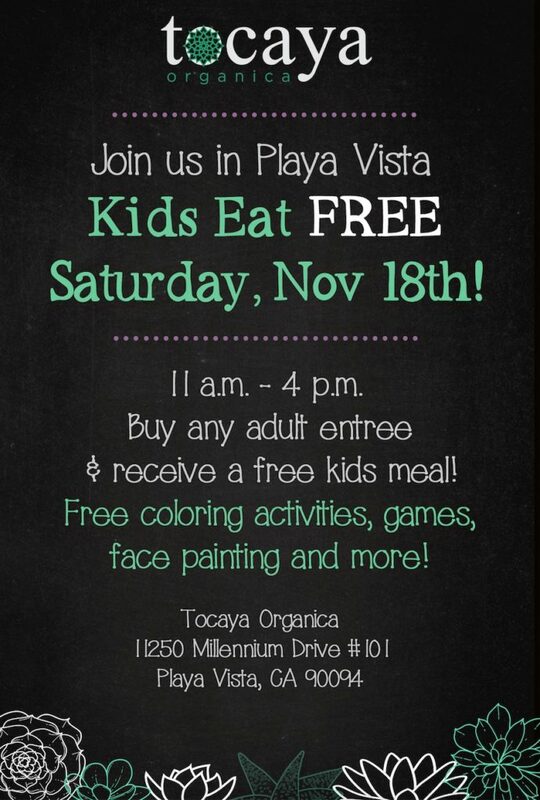 Modern Organic Mexican restaurant Tocaya Organica located in Playa Vista will host a kids eat free day this Saturday, November 18 from 11 a.m. to 4 p.m. Simply purchase an adult entree and receive a kids meal free of charge. In addition, families can enjoy complimentary coloring activities, games, face painting and more. Learn about the many vibrant regional cuisines of Mexico through in-depth lectures, cooking demonstrations, tastings, and hands-on participation during Flavors of Mexico. Taking place at the Skirball Cultural Center, the monthly series continues with Jimmy Shaw of Lotería! Grill. Tickets cost $125 a person. Mr. C Beverly Hills extends their popular Poolside Cinema series into fall every Tuesday evening, from October 10 through November 21. Visit the gorgeous yacht-inspired pool deck where you’ll ensconce yourself in a lounge chair for a film and elevated bites under the stars. The series continues with a screening of The Karate Kid. Everson Royce Bar located in DTLA offers a Wine Wednesday special every week where $25 gets you a flight of three wines and an ever changing array of entrees created by chef Matt Molina. The Vegan Taqueria will debut what they call an “insane burger” this Thursday at Cosmic Brewery starting at 6 p.m. until they sell out. Spaceland & Mercy for Animals present Circle V, a vegan music festival celebrating animal rights, at the Regent Theater in Downtown L.A. The festival will feature live music from artists like Moby and Reggie Watts along side speaker panels and a vegan vendor village. Ticket options range from $35–$150. Downtown Burbank is hosting the 2nd Annual Winter Wine Walk & Street Fair. Walk through over 30 local shops and stores for wine and beer tastings, as well as small treats. The evening also includes local shopping, live musical performances and a magical snowfall moment. Participation in the Wine Walk is $45 while the street fair is free. The BBQ & Beer Festival takes over Pearl’s BBQ in the Arts District for a day of music, barbecue and beer. Enjoy a plate of brisket, ribs, and chicken with ice-cold beers. Some vendors include Pearl’s BBQ, Taste of Pace Daddy’s Fried Chicken and Mad Miller BBQ. General admission tickets cost $17 and VIP tickets are $45 which includes your first drink free, samples of spirits and snacks, a Pearl’s BBQ tote bag, and a VIP area. Feastown at Eastown, a new, bimonthly popup night marketplace featuring food vendors and live music, debuted in Hollywood October and now returns for two Saturdays in November with a Thanksgiving-theme. There is no cover to attend. Part of the proceeds from food purchases will go to help locals in need. Belcampo in Santa Monica hosts a weekly Sunday Supper dinner series offering a 3-course meal incorporating Belcampo’s sustainable and high-quality meats for just $35 per person. Edendale Branch Library will host a Q&A with Guerrilla Tacos founder and chef Wes Avila, along with Richard Parks III. The event coincides with the release of Avila’s new recipe book (co-written with Parks) simply titled, Guerrilla Tacos. They’ll discuss the inspiration behind Avila’s taco creations and favorite techniques. A book signing follows the Q&A. Admission to the event is free however registration via Eventbrite is highly recommended.